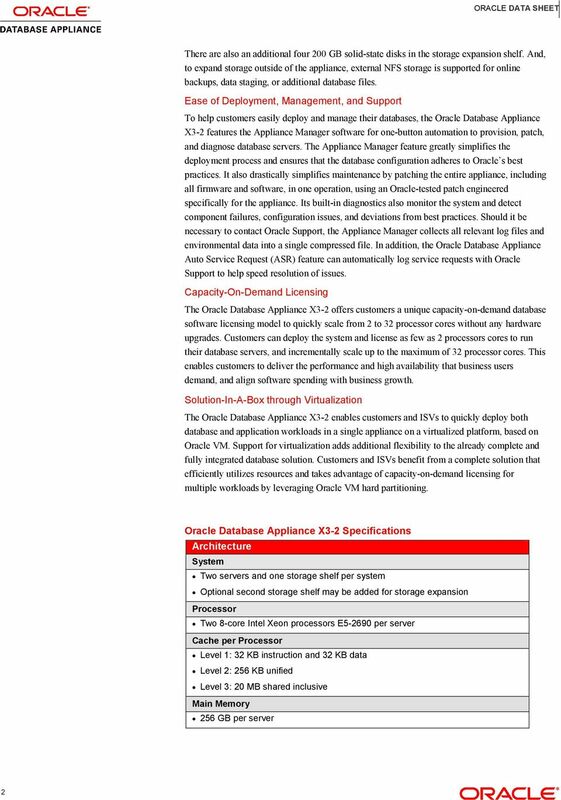 Download "ORACLE DATABASE APPLIANCE X3-2"
1 ORACLE DATABASE APPLIANCE X3-2 FEATURES Fully integrated database appliance Simple one-button installation, patching, and diagnostics Oracle Database, Enterprise Edition Oracle Real Application Clusters or Oracle Real Application Clusters One Node Oracle Automatic Storage Management Oracle Enterprise Manager Oracle Linux Oracle VM Two database servers 32 processor cores 512 GB of memory Up to 36 TB SAS disk storage with optional storage expansion BENEFITS World s #1 database High availability database solutions for a wide range of applications Reduced planned and unplanned downtime Cost-effective consolidation platform Ease of deployment and management Single-vendor support Capacity-on-demand licensing The Oracle Database Appliance X3-2 saves time and money by simplifying deployment, maintenance, and support of high availability database solutions. Built with world s most popular database Oracle Database it offers customers a fully integrated system of software, servers, storage, and networking that delivers high availability database services for a wide range of custom and packaged online transaction processing (OLTP) and data warehousing applications. All hardware and software components are supported by a single vendor Oracle and offer customers unique capacityon-demand software licensing to quickly scale from 2 to 32 processor cores without incurring the costs and downtime usually associated with hardware upgrades. Fully Redundant Integrated System Providing access to information 24/7 and protecting databases from unforeseen as well as planned downtime can be a challenge for many organizations. Indeed, manually building redundancy into database systems can be risky and error-prone if the right skills and resources are not available in-house. 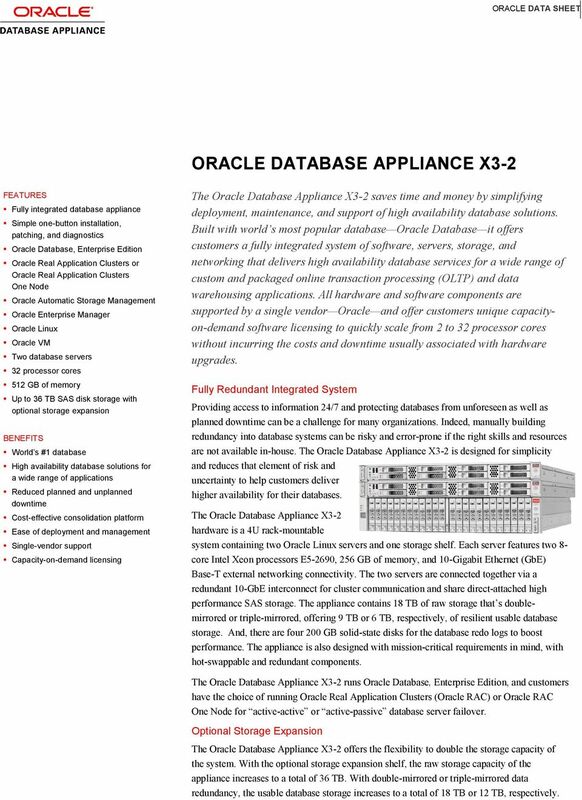 The Oracle Database Appliance X3-2 is designed for simplicity and reduces that element of risk and uncertainty to help customers deliver higher availability for their databases. 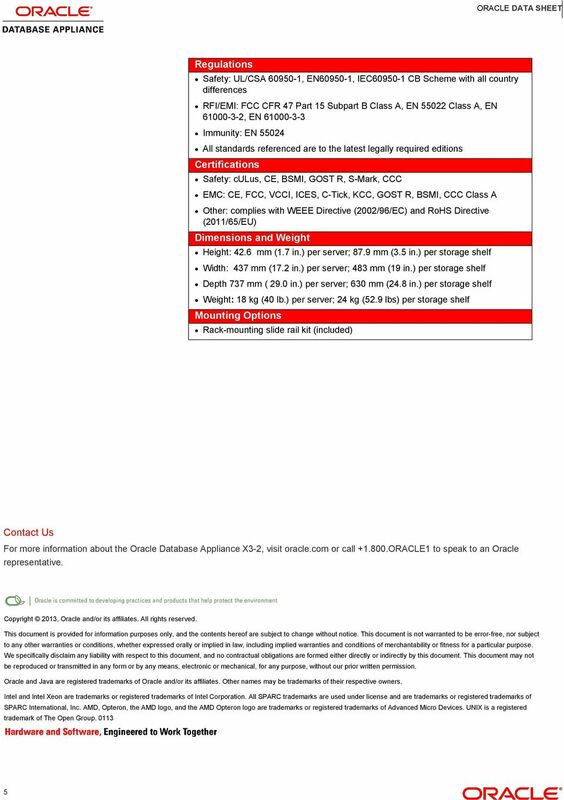 The Oracle Database Appliance X3-2 hardware is a 4U rack-mountable system containing two Oracle Linux servers and one storage shelf. Each server features two 8- core Intel Xeon processors E5-2690, 256 GB of memory, and 10-Gigabit Ethernet (GbE) Base-T external networking connectivity. The two servers are connected together via a redundant 10-GbE interconnect for cluster communication and share direct-attached high performance SAS storage. The appliance contains 18 TB of raw storage that s doublemirrored or triple-mirrored, offering 9 TB or 6 TB, respectively, of resilient usable database storage. And, there are four 200 GB solid-state disks for the database redo logs to boost performance. The appliance is also designed with mission-critical requirements in mind, with hot-swappable and redundant components. 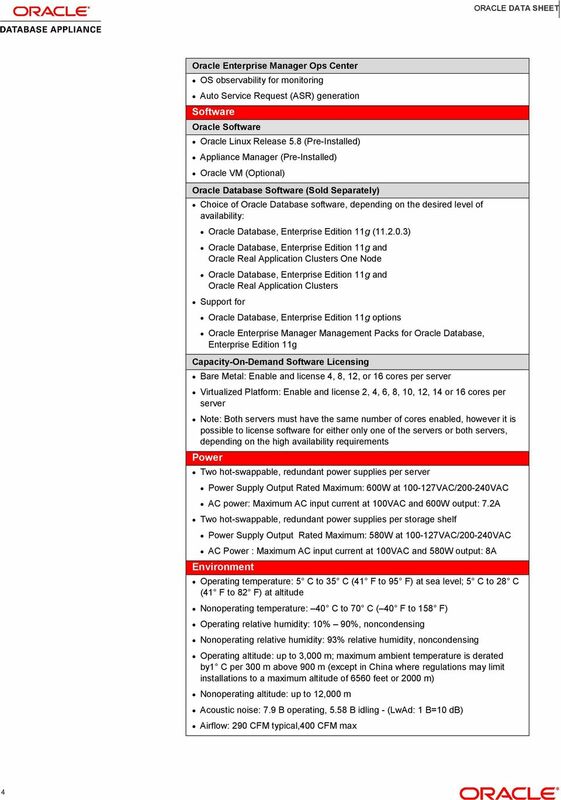 The Oracle Database Appliance X3-2 runs Oracle Database, Enterprise Edition, and customers have the choice of running Oracle Real Application Clusters (Oracle RAC) or Oracle RAC One Node for active-active or active-passive database server failover. 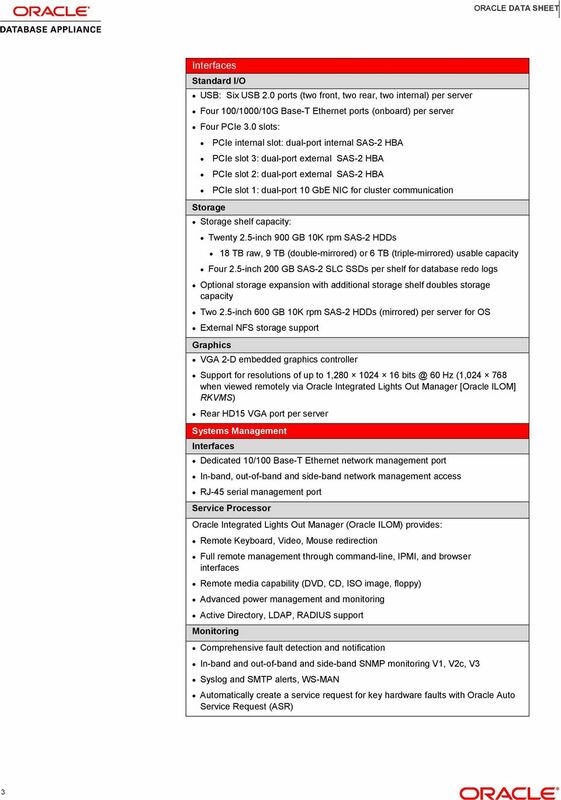 Optional Storage Expansion The Oracle Database Appliance X3-2 offers the flexibility to double the storage capacity of the system. With the optional storage expansion shelf, the raw storage capacity of the appliance increases to a total of 36 TB. With double-mirrored or triple-mirrored data redundancy, the usable database storage increases to a total of 18 TB or 12 TB, respectively. Oracle Quad 10Gb Ethernet Adapter Oracle Quad 10Gb Ethernet Adapter is the latest high-bandwidth, low-power network interface card (NIC) based on the Intel Ethernet Controller XL710 10 GbE controller.